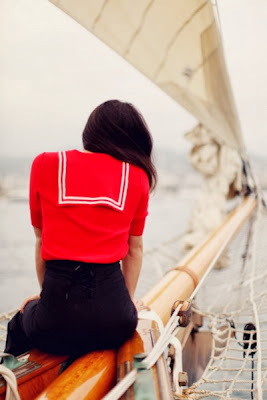 I have always loved the combination of navy blue and white interiors especially those that incorporate stripes and have a nautical flair without being too literal and I definitely am drawn to nautical inspired outfits as you can see below in my shop the look feature. 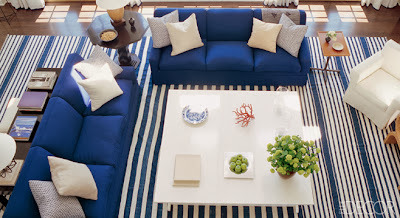 This space is iconic to me as it is featured on the cover of Elle Decor Style and Substance and always comes to mind when I envision casual nautical chic. Stripes are not only effortless and chic but are such a staple in a wardrobe, definitely in mine anyways. Sometimes I often wonder if people think I only own striped shirts because more often than not I wear striped shirts a couple times a week whether paired with casual jeans or more tailored black or red pants. Shop the look with LDB by clicking on the links below. 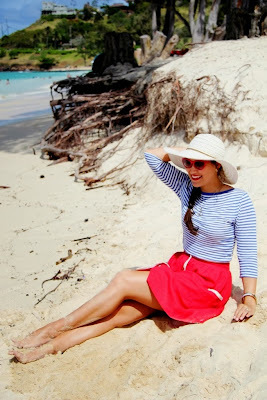 These are a few of my favourite nautical beach finds from designers such as Tory Burch, Ralph Lauren and J Crew. Food, Fashion, Beauty & INTERIORS.